Metal Spray Supplies Australia (MSSA) is a leading manufacturer and supplier of metal and thermal spray coating equipment and consumables to alter the surface attributes of industrial materials in the oil and gas sector and marine industry. The company provides a number of engineered surfaces for exceptional performance. For example, solutions can increase conductivity, provide insulation, repair worn substrates etc or reinforce structural integrity to improve product performance and longevity in a cost-effective manner. The metal spray process is a coating procedure used to change the surface properties of a component by adding a thin layer of material to its exterior. Spraying can strengthen the durability of a component, as well as increase or reduce friction, facilitate protection against corrosion or change the object’s electrical conductivity properties. It can even act as a replacement for worn or damaged material. The coating process can be carried using a wide range of metals, ceramics or plastics. In addition, the coatings can be applied substrate materials such as glass, plaster, polystyrene and even wood. Each substance possesses its own unique benefits and properties to help suit clients’ needs in wide array of application environments. MSSA’s range of equipment includes hard-surfacing products to combat wear, heat and corrosion that are widely used in critical operations throughout the oil and gas industry. Components can be refurbished with added resistance to wear, decay and elevated temperatures by employing specially designed nickel and cobalt alloys. MSSA can also supply cast or fully machined replacement components according to customer specifications. MSSA’s thermal-sprayed aluminium (TSA) and thermal-sprayed zinc (TSZ) solutions are frequently used to provide anti-corrosion and corrosion under insulation (CUI) safeguarding for oil rigs and flare booms. Stellite cobalt-chromium alloys, known for their wear-resistant properties, can also be used with the company’s thermal spray equipment for extra strength protection. Additionally, the company provides arc spray equipment, which uses an electric arc to melt metal wires into a molten liquid to be atomised with compressed air, creating a spray stream to protect and repair the surface of parts and components. The arc spray process is a versatile solution that has also been used to facilitate the creation of anti-slip flooring. MSSA’s flamespray technology uses an oxy-fuel flame to melt wires, or in some cases powdered materials or ceramic rods, which is then applied to surfaces via oxy-acetylene or oxy-propane metal spray systems. While usually a manual process conducted with handheld spray systems, the procedure can be carried out in either an automated or semi-automatic fashion if necessary. The company also supplies high-velocity oxygen fuel (HVOF) process equipment for scenarios requiring particularly dense and heavy-duty adhesive coatings. This procedure involves mixing fuels, commonly kerosene or hydrogen based, with oxygen and then ignited in a combustion chamber, which is accelerated via use of a nozzle system. Powder is added to the gas flow stream where it becomes softened, and is applied at high speed to its intended surface. The process results in an extremely durable and hard-wearing coating often used in hard chrome replacement applications. Oil and gas industry components are routinely exposed to a variety of difficult wear mechanisms during their operation, and this makes ensuring long product life, reliability and minimising 'downtime' a key issue when designing and implementing these kinds of products. 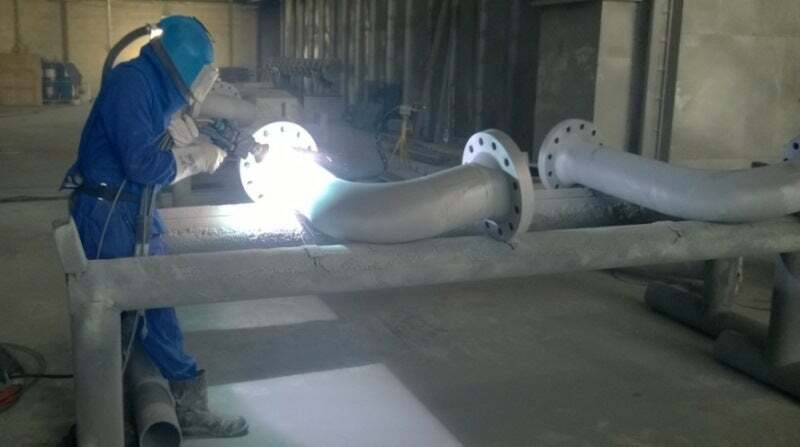 Metal Spray Supplies is a specialist provider of metallisation and other coating solutions, able to offer expert assistance and advice regarding a comprehensive array of thermal spray and specialist welding processes. Petrochemical companies have reported that corrosion under insulation (CUI) within pipeline systems has proven to consume a significant percentage of their operations' maintenance budgets. Metallisation flamespray solutions have been implemented to help protect a BP Clair Ridge offshore platform from corrosion damage. East Anglia-based Gardwell Coatings Limited has applied Metallisation's Thermal Sprayed Aluminium (TSA) coating to an offshore oil platform via the Metallisation MK73 system, in order to protect the structure from corrosion. Metallisation's commitment to continuously improving and developing its technologies has led to the release of the new 145 Metal Arcspray System. Metallisation's 28E ARCTEC is a durable, non-slip coating ideal for application on steel floors, decks and panel surfaces across a diverse range of industries, from train steps to oil platform worksites. Belgium-based Iris NV has expanded its use of metal spraying process in its industrial activities, and has purchased additional Metallisation equipment to help facilitate this expansion.